OHPI continues to have a significant online presence. Our Facebook page currently has over 24,000 supporters, 80% of them are from Australia, this is an increase from 19,000 a year ago. Our reach on Facebook over the course of the year was 2,770,808 of which 68% was organic. We continued to be active on Twitter where our total number of Tweets is now 2,662 Tweets (up from 2,365 Tweets a year ago) and we have 727 followers (up from 571 a year ago). Our website was viewed by over 57,500 people during the financial year, a 13% decrease from the previous financial year. 84.9% of our visitors were new visitors and 15.1% returning visitors. 65% of visits were from Australia (an increase over 56% the previous year). 16% of our visitors were from the US, 4% from the UK and 2% from Canada. 41% of traffic to our website came from organic searches, 35% came from social media, 20% from direct links (e.g. from within our newsletters) and 4% came from referrals from other sites. 96% of social media traffic was from Facebook and 3% from Twitter. 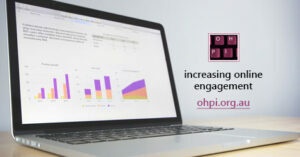 The BBC (at both bbc.com and bbc.co.uk) was the top external site referring people to OHPI. Our success in search results demonstrates that we have content people are looking for, while the significant traffic from social media indicates our social media strategy has been working. The impact we have is only possible thanks to our supporters. If you believe in making a difference and helping to prevent the spread of online hate, please support our work by donating today.